At the University of Central America (known affectionately as “The UCA, ” pronounced oo-ka) in the heart of the city of San Salvador, grows a beautiful rose garden. The roses were planted and meticulously tended by a man named Obdulio Ramos. Obdulio once worked at the UCA as a handyman and landscaper, and his wife worked for the University, as well, keeping house for the Jesuits who served as leaders, scholars and teachers. On the night of November 16th, 1989, Julia Elba Ramos and her daughter, Celina, who was staying overnight with her mother, were awakened, dragged from their beds, and savagely murdered, along with 6 Jesuit priests who were living in the house: Ignacio Ellacuria, Segundo Montes, Ignacio Martin-Baro, Amando Lopez, Juan Ramon Moreno, and Joaquin Lopez y Lopez. Father Ellacuria, the president of the UCA, had been an outspoken critic of the corrupt leadership of the Salvadoran government and the civil war being waged against its own people. The government sent soldiers to assassinate him and to brutalize his body, and were given instructions to leave no witnesses; hence, the “collateral damage” of the 5 unlucky priests, the blameless housekeeper, and her 16-year-old child. The bodies were discovered the next morning, most of them prostrate on the lawn—the very ground where Obdulio’s roses now grow. These shots were heard around the world. Pictures of the slaughtered innocents were circulated widely, symbolic of the massacre of an entire people. International pressure forced the government to sign peace agreements and made way for more peaceable leadership to take root in El Salvador. The murders of these good people were terrible, and citizens around the world were moved to insure that their lives and deaths not be wasted. They are remembered to this day as martyrs whose sacrifice saved a nation and countless lives, and their collective symbol has since been the rose. Human beings have long associated Roses with Remembrance. The rose is a perennial: she blooms, faithfully, each year, attesting to the pitiless passage of time and, simultaneously, renewing the promise of the eternal. She is the queen of flowers, the biggest of blooms, possessor of the odor and attar that soothes and enchants all who approach her. It is no accident that the flower arrangement that best bespeaks our grief is the Bleeding Heart: white carnations arranged in the shape of a heart riven by a streak of blood-red roses. Red roses, in particular, are associated with human passion, with the heart, and with precious human blood—all words and things demonstrative of life. They insist, in the face of loss, that love endures. Five years ago, on the 16th anniversary of these deaths, I visited the rose garden at the UCA. It was a warm November day in San Salvador, and the roses bloomed in shameless abundance. I was awe-struck by the peace of the place, a small corner that breathes beauty amid a troubled city, blighted by new violences and new injustice, kidnappings and gang killings and grinding poverty, the wars—ever ancient and ever new—waged against the human spirit. 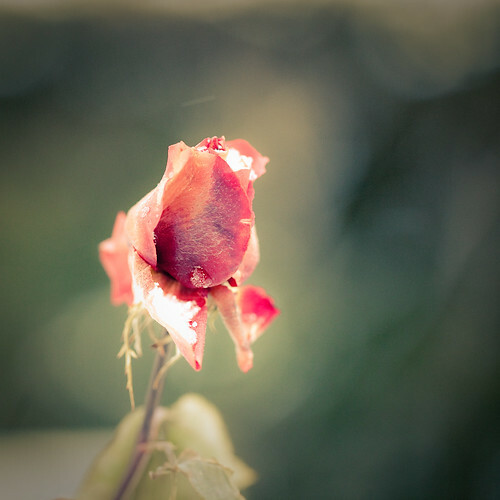 I also learned that Obdulio had since died and another gardener has taken over his task of keeping these roses blooming, a husband’s and father’s refusal to forget outliving his own mortal body. The strangeness of being in that place—ground where precious lives were lost—and witnessing the testament of roses, made me feel the presence, in an other-worldly way, of the men and women who breathed their last breaths there. The roses were rife with remembrance of people I had never met, and somehow they were there among us, reminding us of how steep the cost of freedom, justice, and peace has ever been (and will ever be). “A terrible beauty is born” (gracias, Senor Yeats), and that “Beauty will save the world” (gracias, Senor Dostoyevsky). I wrote the poem below in the days that followed, another attempt at remembrance—though no arrangement of words can offer the solace of a single rose. your new wounds blooming red as roses. The man who planted them is gone. roused from your lonely beds. shaming the proud and the fortunate few. No one calls you saints, even now. at the heart of the martyrs’ garden. This whole post is exquisite, as is the poem. I’m writing on a similar theme for Northern Ireland, but without the roses. It needs roses. It would have been simple enough, I suppose, to merely say it was a mother and her daughter and six Jesuit priests. But you called them each by his and her own name, that standing in its own small way with the roses to remember them, it seems. Thank you, for naming them. And also? What Megan said. Exquisite. So beautifully written, and moving. To know this story is to look at the rose with new eyes. Beautiful, compassionate piece, Angela. Thank you, thank you. Truly beautiful. Truly. Thank for each word, each name, each echo of life. Thank you, Gentle Readers, All. I am honored by your remarks and appreciation for the piece. This is the first time I have written openly about that trip to El Salvador 5 years ago. Though I have written poems and private journal entries aplenty, I haven’t published any of them. I was concerned about tresspassing on their private grief, dis-respecting their Mystery. The whole week was overwhelming: The Rose Garden, the chapel where the saintly Archbishop Romero was killed, his tomb in the crypt of the Cathedral, the living presence of the martyred Maryknoll women–all of this collective waste and sorrow felt beyond my capacity to express. So I’m grateful for the invitation to write about Roses. Pondering the flower itself is what led me to these thoughts, these memories, this essay. I’m also very grateful for David Romero’s photograph, which I first saw a few months ago. 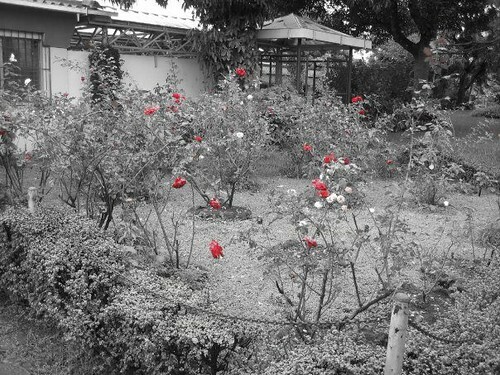 Those red roses against the black-and-white world reminded me of those people and that place so powerfully. It was almost as good as going back. Words fail…Thank you for sharing. Angela, Every post of yours I read moves me. Thank you for sharing your lyrical prose, your vivid imagination, your compassion and empathy; I am so grateful that you invite me–us–into your vision and your words. Thank you. Glad someone remembers the events of this awful day in an appropriate manner. We should take cuttings from the these roses and plant it in another Rose Garden in Washington to remind each sitting president of the price of complicity with evil “in our national interest”.